It’s been a while since I last put up a Sixth Sense video, but this incident today was ripe for a fresh video. Enjoy! Some highlights from a recent ride out with the East London Advanced Motorcyclist (ELAM) group I’m with. A great day blitzing around Herts and Essex. Hope you enjoy it! A full review of that Nautilus Stebel horn can be found here. Whilst quietly filtering through some suburban traffic approaching the A13 I managed to drop the bike. Again. I was just about to start filtering past a queue of traffic when a car decides to do the same thing and pulls out on me. I panic braked, locked up front wheel and down she went. All very low speed (as usual), didn’t even hit other car, they just carried on oblivious. Grrr. Totally smashed the fairing, crash bars did their job, but various other bits are scuffed. New fairing on order, but bit skint now, so do us a favour and click on some of my banners and affiliate links. Much appreciated. A key item on the regular service schedule is the replacing of the air filter. On my FZS600 2003 this is due every 6000 miles or every year (whichever is soonest). This year however, I decided to fit a K&N reusable filter, slightly more expensive but it should pay for itself after a couple of years. 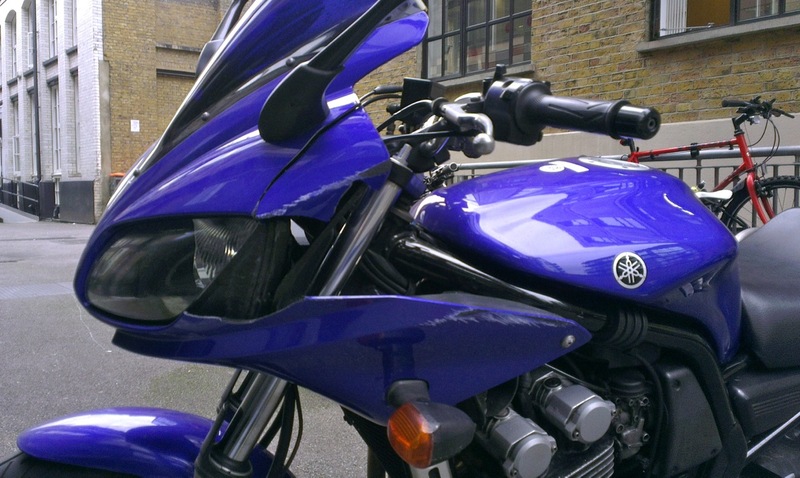 The Fazer 600 is known to run slightly on the rich side, so the increased air flow from a K&N should balance this out. Here’s a quick video run through of how to replace the filter. It’s an easy task that you all should be able to tackle, don’t be put off by having to remove the fuel tank. Tools required are minimal: an 8mm socket, T30 Torx socket/alan key, Philips screwdriver and some needle pliers (to unclip fuel pipe). Ensure you only have a small amount of fuel in the tank to keep it light when removing. Have some tissues/rags to mop up the drop of petrol that’s left in the loose fuel pipe. Don’t forget to turn back on the fuel tap before bolting down the tank afterwards! Buy a K&N air filter off ebay. Ah yes, yet another near SMIDSY. You can probably spot this one about to happen a mile off, however today I’m going to give you a break down, step by step, my thought process and what I did to mitigate a potentially unhappy bike-car interface. These are some techniques I’ve picked up over the last couple of years and find invaluable, but do let me know if you have further tips for this kind of situation. I’ve also been experimenting with dubbing on a narration in an attempt to make my videos a little more engaging. Feedback in this respect would be much appreciated. On the bike, we have to continually keep our wits about ourselves, be ready for whatever surprise pops up. This was a bit of a close call, a bit higher and it could have screwed up all visibility. Another example of some fine driving by a young man in a small hatchback with his companions. Happily enjoying a quiet drive and making best possibly use of all lanes of the carriage way. Maybe. See if you can spot where the reality deviates a little.